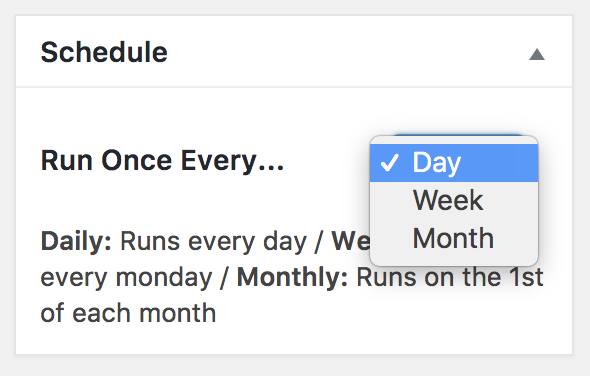 The scheduler is a very powerful feature, available in all premium plans. It can automatically import schedules using your saved templates. This allows you to have your site in full automatic pilot with jobs added daily, weekly or monthly. Avoid having too many schedules running Daily (set some to run Weekly), or limit the number of jobs per feed, and try to have them run when your site is less active. If your schedule returns a very large number of jobs and you have too many schedules you might get slower performance on your site. The template dropdown will show all your pre-saved templates. If you don’t have a template for the current schedule you can click Create Template to create one. Afterwards you can return to the schedule and select it. For this example, we’re creating a Musicians jobs schedule using Indeed as a provider. Under the content setup you can choose the import time period. Choose Today (*) to return today’s jobs from the feed or Custom to specify a custom days interval (minimum days recommended is 2 days). This tells the scheduler to retrieve jobs from the last n days. (*) Today is not recommended since this will depend of the time the provider feed is updated and the time your schedules run. Use this field to set the max number of jobs the feed should retrieve. If you have a large number of schedules it is recommended to limit the number of jobs beteeen 20 and 50. Use the Positive Keywords field to specify keywords that MUST exist on a job title or description to be considered valid for import. Use the Negative Keywords field to specify keywords that MUST NOT exist on a job title or description to be imported. You can separate words with commas. Here you set the frequency that which the schedules should run. If you have several schedules it is recommended to split them between Daily and Weekly/Monthly to avoid having too many schedules running on the same day. 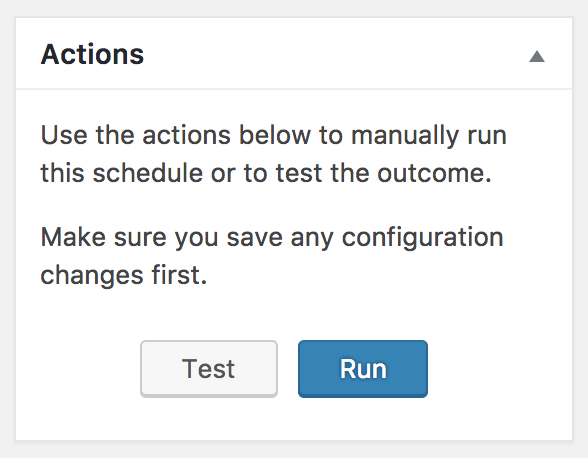 The manual actions are useful if you need to Run a specific schedule manually or in case you need to Test a schedule. When you manually run a schedule, it will run as if it was being triggered by WP Cron. Use it if you need to trigger an import before the WP Cron events runs. You can see the imports stats on the log table. Use the Test button to test if a schedule is working as expected (debugging). When you do a Test Run, the importer will only simulate the import to test it, no jobs will be imported. You can see the test stats on the log table, which will be displayed on a gray background. You should be familiar with this option. Like regular posts, you can assign an author to a schedule. When you’re ready to have your schedule running just click Publish. It will run immediately, the first time you publish it. If you’re not ready you leave it Pending. Schedules run using WP Cron, which means that your site must have visitors for the cron events to work.